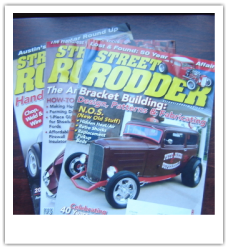 Street Rodder is an excellent magazine that includes most everything about Street Rods. As part of the Street Rodder magazine, each month a custom car or street rod is featured. This article will detail the car, and give reviews from the experts at Street Rodder. In addition, Street Rodder also provides excellent technical articles with in-depth knowledge about most any aspect of the industry.